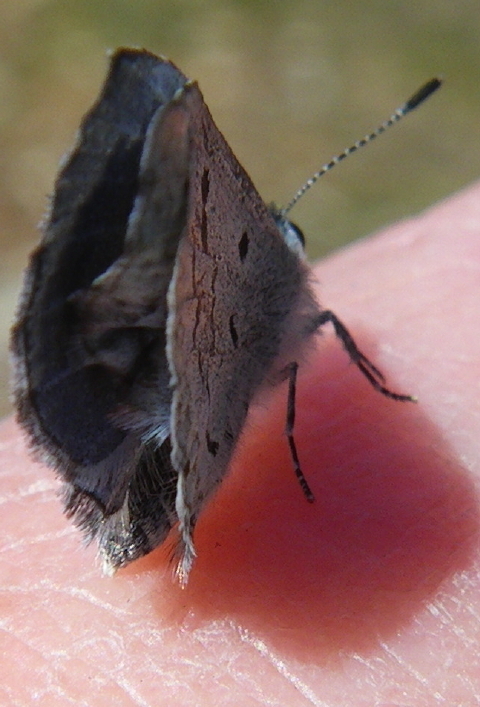 We snapped pictures of the butterfly as it alit on Don Lewis’ finger with our Pentax Optio W60 underwater camera with a special 1 cm macro lens. With all the expensive cameras that Turtle Journal lugs around to capture the world of Nature, nothing has served us better for detailed closeup field photography. 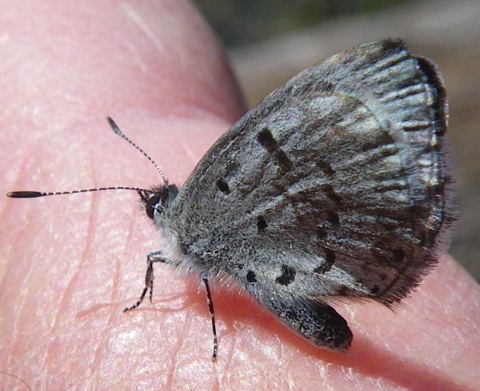 Checking reference books on our return to Turtle Journal headquarters, we identified the critter as a Spring Azure Butterfly (Celastrina laden). According to Butterflies and Moths of North America, the upper side of males are blue. 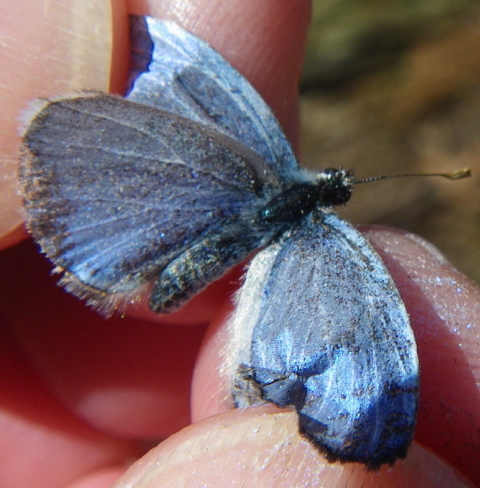 Males are most active from mid-afternoon until dusk, the period when we found this specimen. 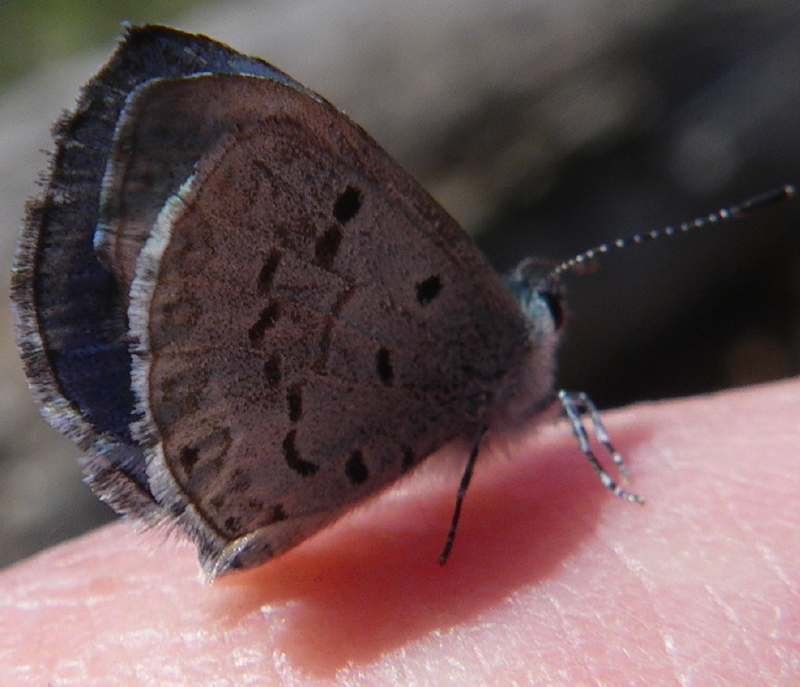 The habitat for the Spring Azure Butterfly is described as “openings and edges of deciduous woods, old fields, wooded freshwater marshes and swamps;” a perfect description of the long abandoned and flooded Grassi Bog. Now that we have met this delicate butterfly, the Turtle Journal team will keep a sharp eye out for more specimens. As we wade reluctantly into the chilly waters of autumn, this moment seems ripe for a celebration of those last warm, sun-filled days when the buzz around the Cape was a real buzz around the Cape. Pause for a moment and join some busy bees for a deep sip of summer’s sweet nectar. And now for the less warming news. We found our first woolly bear this week and it seemed wrapped thickly in a heavy winter coat. If we really believed those old folk tales about predicting the harshness of the season-to-come based on the quality of the woolly bear coat, we would be storing firewood by the cord. 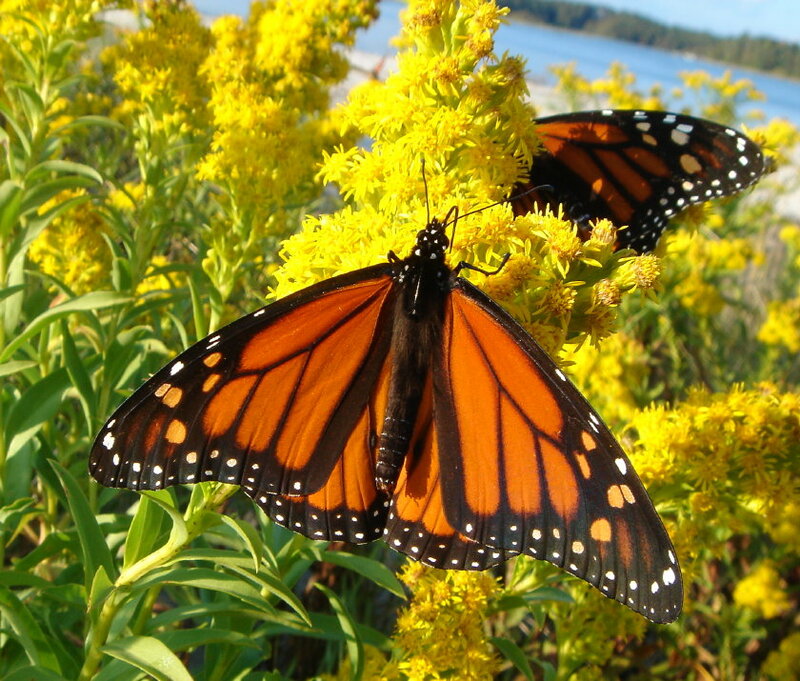 September on the SouthCoast opens a window into the endless, cyclical, multigenerational migration of monarch butterflies from the Great White North to Mexico and back again. We’re told that it takes two generations each way or four generations for the complete migration cycle. How fortunate we are to witness one end of this epic flight as monarchs feast on milkweed and golden rod in the coastal fields along Cape Cod and Buzzards Bay. Today, as we walked the trail at Mass Audubon’s Allens Pond Wildlife Sanctuary in Dartmouth, we came across several monarchs sipping golden nectar to garner strength for the long journey ahead. This same time last season at Demarest Lloyd State Park also in Dartmouth, we happened upon a large flock of monarchs preparing to kick off their migration southward. Strolling down the beach road off Mass Audubon’s Allens Pond Wildlife Sanctuary, we caught sight of a praying mantis crossing in front of us. 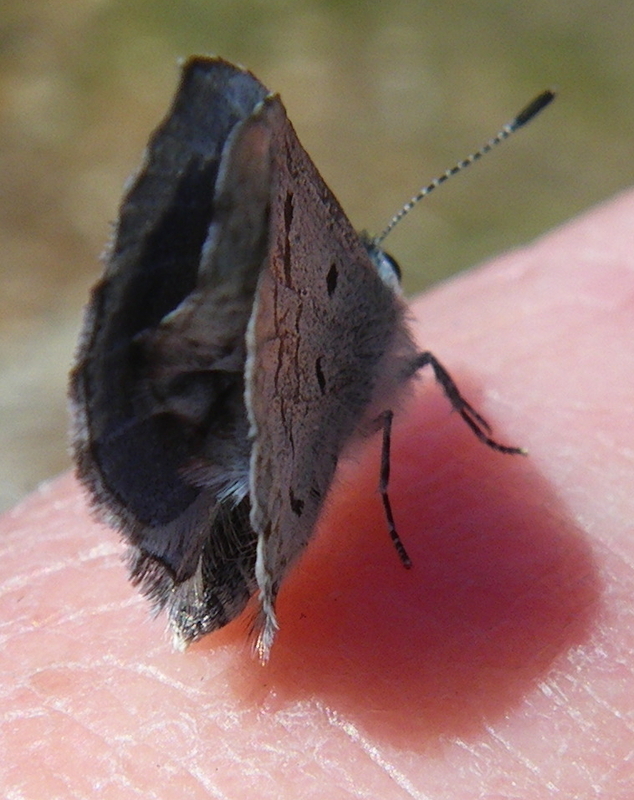 Its sand colored topside with greenish head and wings blended perfectly with the beach sand roadway and we would have missed the critter entirely if it hadn’t been startled by our presence and darted for the dense abutting vegetation. From the deserted, post-summer look of things along this stretch of Dartmouth beach, the praying mantis prettry much had the road to itself and expected no two-legged or four-wheeled creatures to intrude on its constant hunt for tasty treats among the lush salt marsh vegetation. 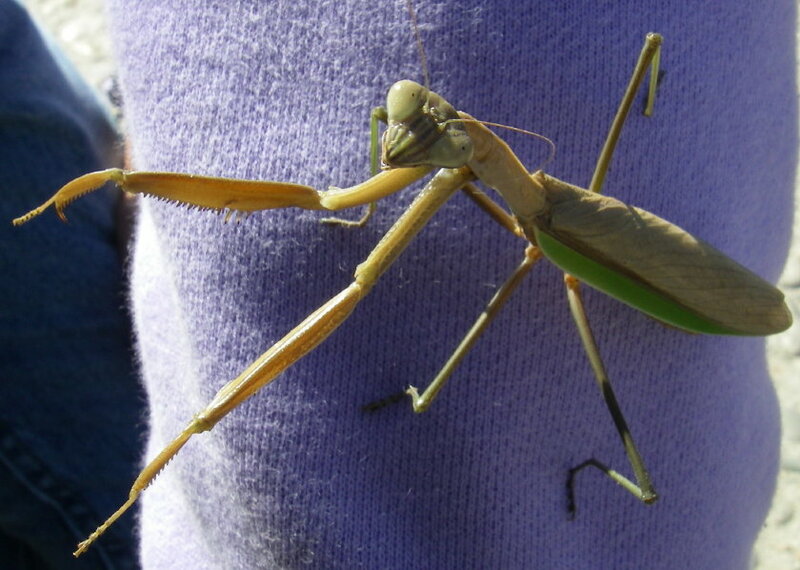 Despite its surprise, the praying mantis tolerated our intrusion … for the moment … as Sue scooped it from the road for a closer inspection. It settled in her hand, assessed us as no threat, posed a bit for the camera and walked around her palm to assess these goofy humans who had stopped to make its acquaintance. As the camera came in for a closeup, its patience with our interruption ended … or the praying mantis saw this shiny silver object as a potential tasty meal. Whatever sparked its interest, the mantis went into full attack mode, first boxing with the camera as though a sparring partner, and then pouncing for the pin like a WWF wrestler. Once placed back on the ground, the praying mantis went about its business as though we had never existed, finding a perfectly camouflaged stalking spot on the stem of a golden rod, holding itself in seeming suspended animation as the stiff September breeze tossed the leaves to and fro, and waited … for some unsuspecting prey to stumble by or perhaps another pair of foolish humans to amuse and then abuse. Voracious and aggressive predators of just pipped diamondback terrapin hatchlings are insect maggots. A large percentage of terrapin nests are invaded by these maggots that destroy hatchlings before they can ever emerge. We have identified at least one species of these maggots. On Monday, 25 August, I observed this flying insect inspecting the tracks of recently emerged hatchlings and then ovipositing immediately atop these tracks on the terrapin nesting dune at Turtle Pass.